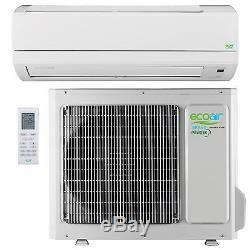 HEAT PUMP SPLIT AIR CONDITIONING ECO1816SD MK2. Wall Brackets for Outdoor Condensor Unit. This Inverter range air conditioning unit, has now arrived. A super small size in terms of dimension but not in performance and efficiency. It has a dehumidification function as well. Ideal for a small office or living room up to 50 square meters or a conservatory size of 35 square meters. For the power, it merely requires a 20amp power socket you may ask an electrical engineer to install. This quality professional Heat Pump Air Conditioning provides heating for winter and cooling for summer. Panel design is very sleek, modern and clean looking. Because this is a heat pump, it is very energy efficient, you get very low cost heating - you will get 5.6 kW of heating for every 1.75 kW of electricity it consumes. Compare this to a conventional electric heater that gives you less than 1kW of heat for every kW of electricity it consumes, this is an absolute cost saver! This air conditioning is priced well for the budget conscious. An absolute push button convenient climate control for a modest investment without breaking the bank on running costs. All F-Gas units must be handle by qualified F-Gas engineer. FREE collection is available on this item from our warehouse. G10 Inverter Technology for rapid heating and cooling Dehumidification Ultra Quiet Operation Quick Start Up Function One Touch Self Cleaning Function Oscillating Air Louvre Digital Display Low Energy Standby (1W). 24 Hour Timer Auto Clean. Settings Memory Sleep Mode Auto Restart European Energy Ratings between A & A+. All split air conditioning units contain F-gas, and is governed by F-gas regulations Under EU regulations: The installation of all split air conditioning units containing F-gas (R410A or R407C) require installation or commissioning by a F-gas certified air conditioning engineer. Outdoor unit Indoor unit with installation plate Remote control and 2 batteries 4m copper connecting pipe kit, upgradeable to 5 or 10 meters 5m Interconnecting cable Installation guide and owner's manual Drain hose, Clip anchors, Self-tapping screws, Seal and Drain join. Please use eBays checkout facility. We accept personal cheque and postal order. Goods will be dispatch upon clearance. We accept credit cards over the telephone. UK offshore courier - Additional charge : Please call for quote. Please inspect item for any apparent damage in transit before signing for the item. Report any damage to us immediately on 0208 459 9155. If you sign and accept a damaged item, it will not be possible to make a transit damage claim from the couriers. This is a large unit. The courier driver may ask for help to move it into your premises for health and safety reasons. Thank you for your cooperation. All return requests be in writing within 14 days from the date of receiving the product(s). This is a professional system and we recommend installation by suitably qualified installers. If you require installation, brackets, anti vibration pads, or extra electrical cables or drain hose. The item "INVERTER SPLIT AIR CONDITIONING WALL MOUNTED UNIT 18000 BTU COOLING & HEATING" is in sale since Friday, July 15, 2016. This item is in the category "Home, Furniture & DIY\Heating, Cooling & Air\Air Conditioning". The seller is "britishaircon" and is located in London. This item can be shipped to United Kingdom, Ireland.